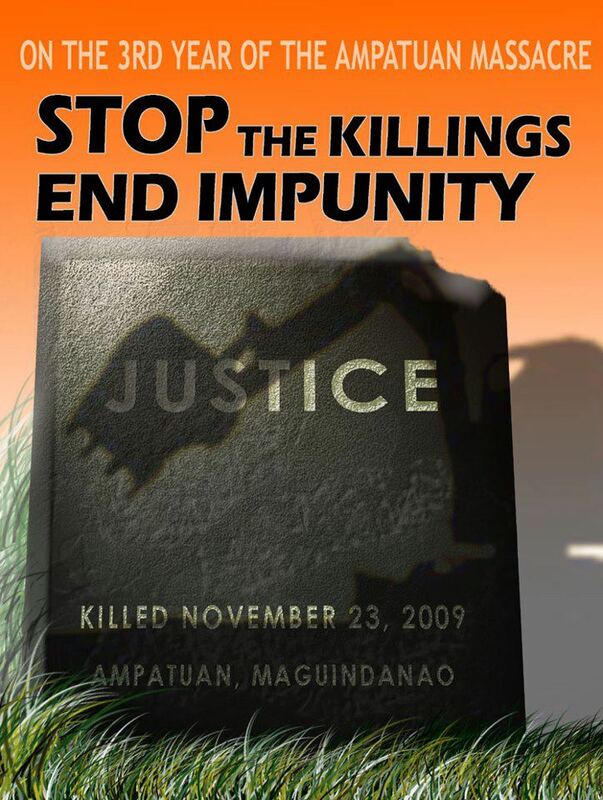 Several members of the Ampatuan clan are now in jail and on trial for the massacre. But of the 197 identified suspects, only 99 have been arrested. Of that number, 81 have been indicted. One of those arrested died in jail while another was released by a court after charges were dropped against him. The rest, mostly members of the police militia called the Civilian Volunteer Organization (CVO), remain at large. The trial so far has mostly concerned the 56 bail petitions filed before the court. The prosecution has yet to complete its presentation of evidence and witnesses. Relatives of victims have alleged that they have faced threats, intimidation, and bribery, allegedly from Ampatuan supporters; one of the widows decided to leave the Philippines this year out of fear. Since the massacre, lawyers for Mangudadatu said at least three actual or potential witnesses have been killed, including an Ampatuan militia member named Suwaib Upham who had agreed to testify and who had sought witness protection that never materialized. In November, the Supreme Court rejected a petition seeking live television coverage of the trial. Relatives of victims told Human Rights Watch that they had hoped showing live coverage would lend transparency to the proceedings and encourage the court to expedite hearings. The Maguindanao Massacre brought to light the dangers posed by private armies, militias, and paramilitaries in the Philippines, but the administration of President Benigno Aquino III has not seriously addressed the problem. Aquino should rescind Executive Order 546, issued in 2006 by then President Gloria Macapagal-Arroyo, which allows the arming of the CVOs by local officials. The Ampatuans justified the recruitment and arming of militia members, ostensibly to fight Islamist rebels but in reality to consolidate their hold on power, by citing Executive Order 546. There are concerns that Executive Order 546 will be used by powerful politicians to arm militias prior to the midterm and local elections slated for May 2013. The Interior Department has already identified 15 provinces as “election hotspots” where political violence has occurred and is likely to worsen prior to election day. Four of these provinces are in Mindanao, among them Maguindanao. The rest are in the central and north Philippines known to have political warlords and a history of election violence. The Aquino administration claims that it has “neutralized” 28 so-called “private armies,” but as recently as last week it identified 107 more of these armed groups. The Interior Department has stated these groups might be used to harass voters. Issue an executive order banning all paramilitary and militia forces because of their long and continuing history of serious human rights violations. To accomplish this, the armed forces and national police should systematically disarm all paramilitary and militia forces, end all private funding of such groups, and implement their staged reduction and disbandment. Issue an executive order requiring all government officials to report firearms acquired for professional or personal use for themselves or immediate family members; amend Executive Order 194 to limit the number and caliber of firearms that civilians can own. Order an appropriate government agency, such as the Commission on Audit, to investigate whether public funds have been used directly or indirectly for creating, arming, and supporting militia forces, and if so, the source of the funds.